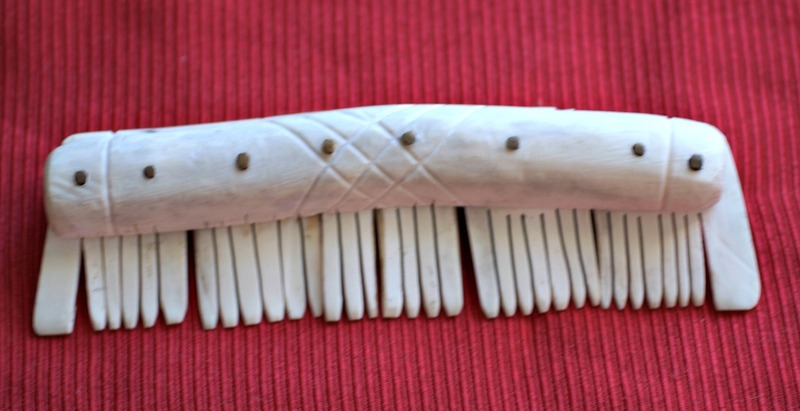 Antler combs are one of the most commonly found Viking artifacts. Antler was preferred over bone because of its greater strength and ability to withstand bending without breaking teeth. For my project I used Red Deer antler, purchased at the Pennsic War. Red Deer Antlers, are known to be one of the most commonly used types of antler for comb making. Most of the combs found in Viking age sites are single sided. The historic combs were riveted together using iron or copper alloy rivets. 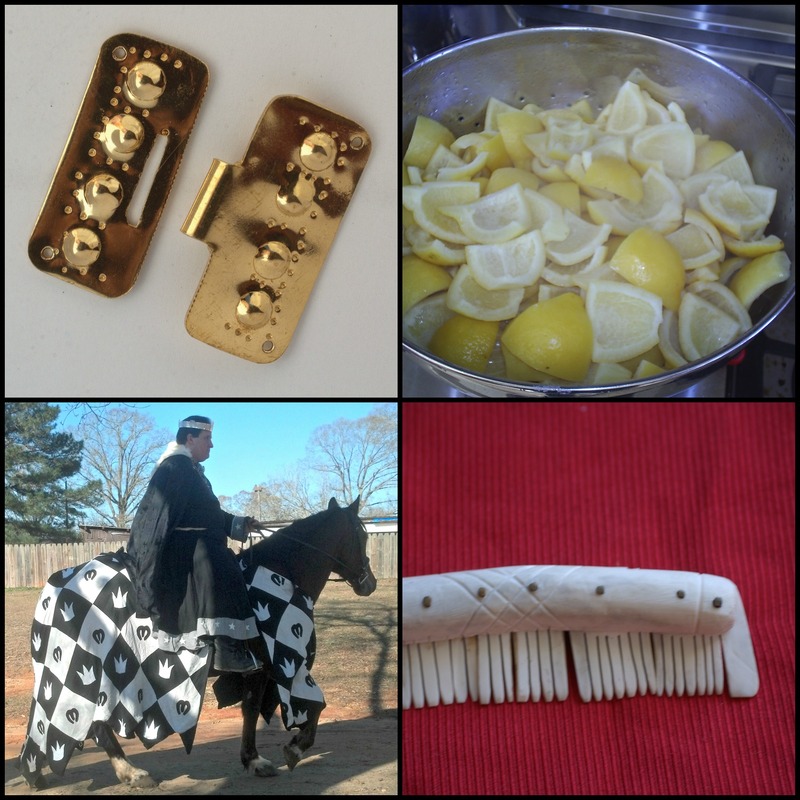 My comb was riveted together using handmade yellow brass (copper alloy) rivets. Comb production was widespread during the Viking age. In some areas, such as Jorvik (York, England) the production appears to have been by nonspecialized workers, and varied greatly in quality, while in other areas, such as Ribe, Denmark, the comb-makers appear to be professional craftsmen, producing beautiful combs of great uniformity and quality. I have had the good fortune to personally see many combs at the York City Museum, The Ashmolean Museum in Oxford, and the Museum of London. Seeing these combs inspired me to try to actually make one myself. Some of my favorite combs, stylistically speaking, were in York. My comb was made using the techniques detailed in several archaeological resources. The basic process is: cut the antler into sheets, cut the sheets into plates for teeth and the comb back, shape the comb back, insert the teeth plates in the comb back, drill and rivet the comb together, saw the comb teeth, shape the comb teeth, decorate the comb, and polish the comb. 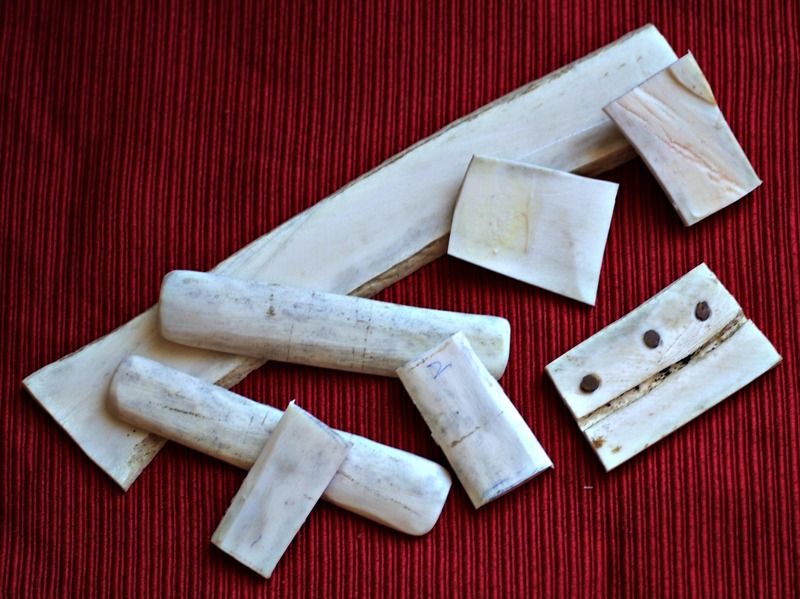 This picture shows the initial sheet (large flat piece of antler) and some of the shorter pieces that were cut for the teeth. The “dots” on the piece on the right are rivets. This was a practice piece to figure out how to rivet the antler without splitting it. I made the rivets by annealing brass wire, cutting it to the approximate length, and peening a head onto the wire. The rivet was then placed in the pre-drilled hole in the antler, trimmed to the required length, and filed flat on the end. I then used a punch and hammer to spread the remaining end of the wire and complete the riveting process. The rivet was then filed to eliminate sharp edges. I used only hand tools for this project. I used a saw, drill, knife, files, and sandpaper, for forming the antler. The rivets were made using a torch (for annealing the rivet metal), a hammer, punch, wire cutter, and file. I also used a dust mask (bone and antler dust is a health hazard), a vise for holding the antler while I sawed it, and a piece of leather to help hold the antler (and protect my skin), both in my hand and in the vise. This is a picture of the back side of the comb. In this type of comb the decoration is essentially the same on both sides. I can tell the difference because the rivets line up better on the “front”. The comb is about 5 3/4″ long by 1 3/4 wide. I was quite impressed by the amount of sheer muscle power that was needed to complete this project. I have completed many projects that required large numbers of hours, but none that required more physical stamina. Sawing the antler by hand was an amazingly tedious and strenuous project. I had never worked with antler before, only bone and horn. My comb is definitely on the clunky side, but I learned a lot about Viking Age comb production. And best of all, the comb really does work!